Bead Up -- the journey of handmade jewelry: I exist - I promise! It's been far too long since I have blogged, and I hate it :( I knew that moving cross-country was going to get in the way of my schedule and, more importantly, my Etsy-ing. Now that we have landed safely in Kansas City, things are starting to get back to normal... sort of! I have been super busy unpacking boxes, trying to find a job, and make this very new place feel like home. Furthermore, I am still working on details for my husband's ordination, which includes the programs for the service and also my necklace for my outfit! But most interestingly, I have been working like crazy on my most massive Etsy order yet -- 200 custom necklaces! 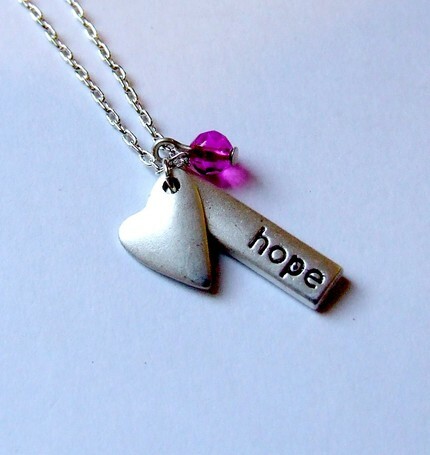 A few weeks ago, a gal messaged me on Etsy and asked if I could make 30 of my "Hope" necklace. I told her that I don't have 30 of any of the components in stock, though I could find something comparable. Well, 30 turned into 50, which turned into 100, which turned into 200! So I have spent the last week trying to find all the supplies on the internet and get them shipped promptly, since these are due next week! Good thing I am unemployed! I will be back in touch soon - and with pictures of my 200 creations! Here we go! You ARE employed!!! You are a jewelry designer and working your craft!!! That's a fantastic order! Congratulations :D Those are lovely necklaces. What is your customer going to use them for, can you share?